If growing your own plants from seed saves you money then why waste that money on fancy seedling containers. I used to be cheap when I started reusing food containers as my seedling containers, now apparently I am environmentally friendly. There are so many things that come into our homes in plastic or fibre containers that can be utilized to produce plants for the garden and reuse is even better then recycle. Seed Starting Trays! For those many things such as Onions and Lettuce that start quite well in a large common seedling containers, I find that take-out food containers make excellent flats. As with all of the items on this page it is important to drill some drainage holes in the bottom of the trays. Sometimes the plastic can be brittle and a little care is needed to actually drill the holes rather than trying to just punch them through. 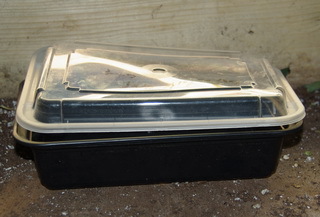 Many of these take out food containers also come with a clear plastic lid that makes an excellent way of retaining the moisture needed for good germination rates. Free Cell Paks! 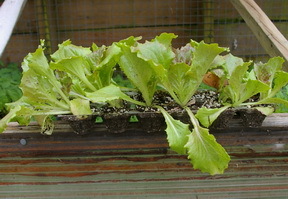 For quick crops that don’t need a lot of rooting space, such as lettuce, egg cartons make excellent cell paks. Plastic ones can be used for a few years and the fibre ones can be cut apart and planted. The fibre when wet in the soil will break down quite rapidly and even supply some organic matter for your soil. Again, make sure you have adequate drainage holes in the bottom. Individual Pots! These come in a variety of sizes to accommodate the various plants that you may want to grow. 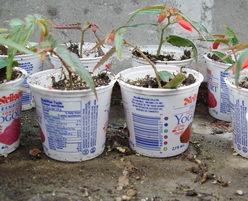 Individual yogurt tubs are excellent seedling containers for a variety of annual flower and vegetable crops. If you prefer to buy your yogurt in large family size tubs then you can utilize those containers for producing bigger plants such as some perennials or those few large Tomato and Pepper plants that you need, to get the head start on summer eating. Remember the drainage. A couple of moments with your drill makes a huge difference. Useful Origami! 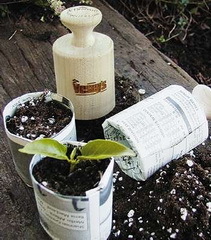 Many seed catalogues sell a small wooden device that allows you to make pots from sheets of newspaper. The whole thing gets planted and the newspaper rapidly decomposes into organic matter for your soil. Be environmentally friendly and reuse a wide variety of containers as plant pots and you will manage to save considerable money at the same time. Spend the money on good quality soil to put into those pots.